Exciting times! 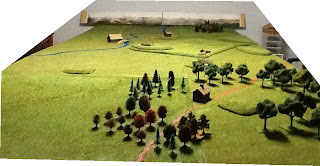 Yesterday we set-up for our Borodino game which we will play on the 200th anniversary, 7th–9th September. Most of the Russians are on the table. The exceptions are Borozdin II's 1st Cuirassier Division, Duka's 2nd Cuirassier Division, Uvarov's cavalry and Platov's Cossacks. 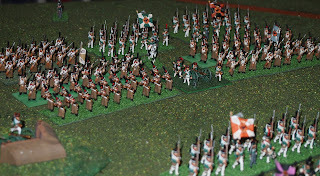 The latter two will arrive for their flank attack at the end of turn 1, but don't tell the French (e.g. me!). On the French-Allied side, the infantry corps, with the exception of Junot's VIII Corps, are on the table (at least partially). None of the reserve cavalry are on-board yet. Nansouty's I Reserve Cavalry Corps is yet to be placed on-board (behind Davout). The rest of the Reserve Cavalry will come on during the game! The majority of the 5 000-odd figures that we require are ready. We'll be madly trying to get these ready with at least a basic paint job (à la Quarrie*, "...it isn't too much to ask of anybody a black shako, red or blue jacket, and grey or white trousers, with perhaps a touch of pink for face and hands, and black for shoes and musket—is it?"). Failing that we'll be improvising with alternatives. Some eagle-eyes will notice the lack of the Borodino church in the photos. Our scratch-built version has come along really well (thanks to Julian), but was too wet for the photos when we "pulled up stumps" last night, so we are gonna keep you in suspense on that one! Anyway, a picture tells a thousand words, so here's a few thousand. Firstly a memory jogger. 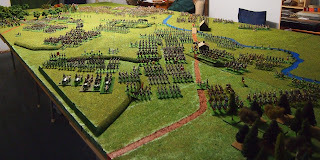 Here was the battlefield when we finished it back in July. Now, here is the same view (nearly) from the south east looking over the woods at Utitsa. The flêches are in the centre of the picture, just beyond the woods. In the centre background, on the large ridge, is the grand redoubt. Two photographs of the view from the opposite, south west corner of the battlefield (taken without and with flash), looking at the French-Allied dispositions. In the foreground are the troops of Davout's I Corps. Beyond them is the Shervardino hill with the Guard in the rear and Ney's III Corps beyond it up to the Kolocha Stream. To the north of the stream are the lead elements of Eugène's IV Corps. This is a huge formation as it was supplemented by two divisions from Davout and Grouchy's III Reserve Cavalry Corps (all currently off-board). 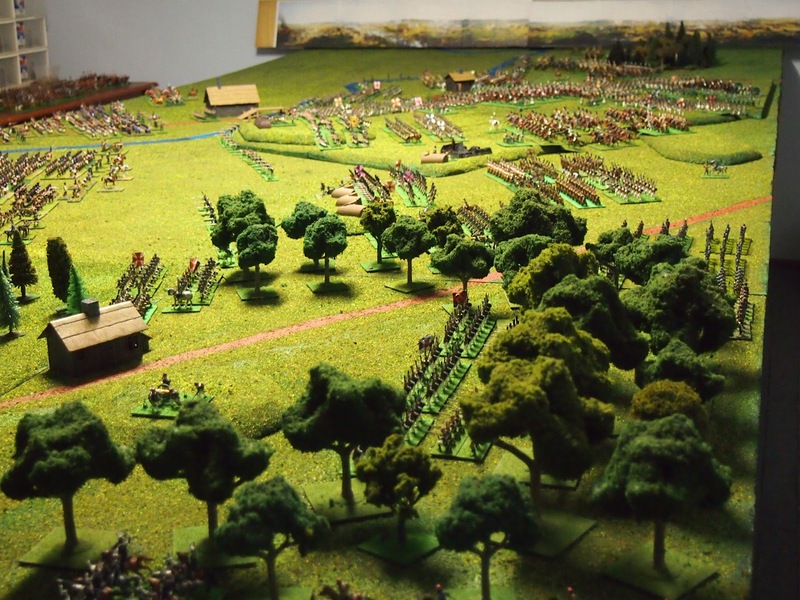 Borodino village is in front of Eugène's troops (sans the church). Further north still is the 'open ground' over which the 'surprise' attack of Uvarov and Platov will appear. Switching our attention to the other end of the table, firstly looking from the north-west. 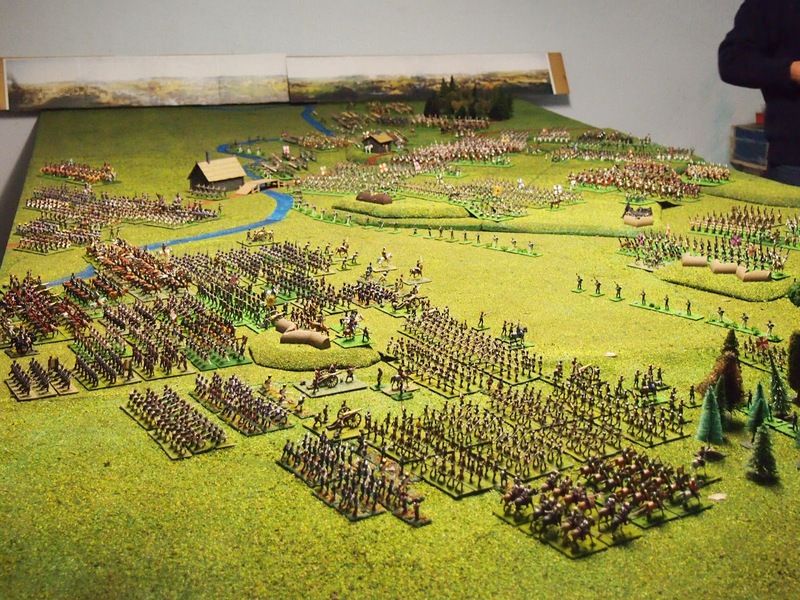 Ornano's cavalry of Eugène's Corps is in the right foreground and forms the northern flank of the French-Allied army. Borodino village and bridge are in the centre of the photo with the Bakhmetyev III's division of Osterman-Tolstoy's IV Corps behind it on the east bank of the Kolocha. The large ridge bearing the grand redoubt can be seen beyond (to the south east) of Borodino and the Kolocha. Note the jägers in front of the Russian position. Looking from the north east down the main Smolensk-Moscow post road we have Korf's II cavalry corps in the right foreground. To the left (south-east) of the road are the Russian reserve artillery and Imperial Guard. 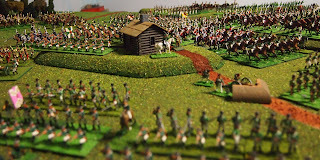 Now, a few close-up views of some of the dispositions. 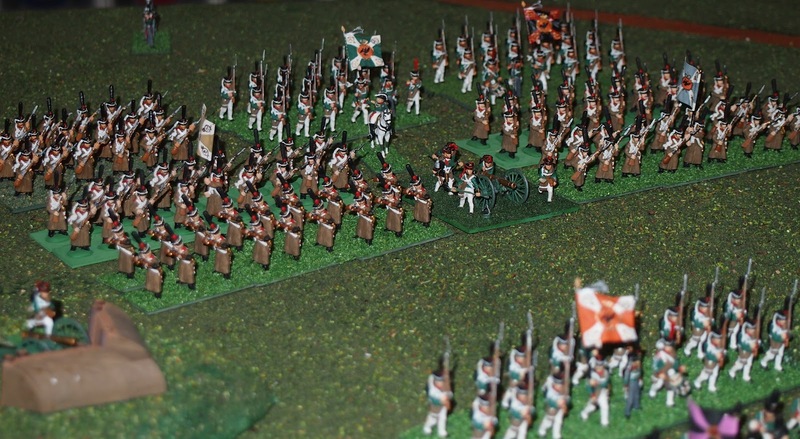 Firstly of the Russian army, beginning with the Imperial Guard infantry (foreground) and reserve artillery behind. Next, the view looking from Eugène's position across the Kolocha to Gorki in the distance. 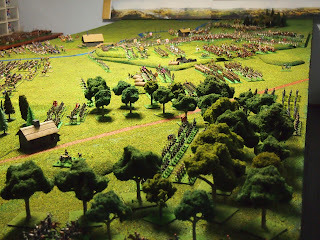 Borodino village and bridge can just be seen at the left of the photo. A close-up view of Gorki with earthworks below the hill. Kutusov is to the right of the village, on foot wearing a brown greatcoat. At the other end of the Russian position, Voronstov's 2nd Combined Grenadier Division of Bagration's 2nd Western Army, stationed behind the flêches. The edge of the earthworks in front of Semeyonovskoye can be see in the bottom left corner of the photo. 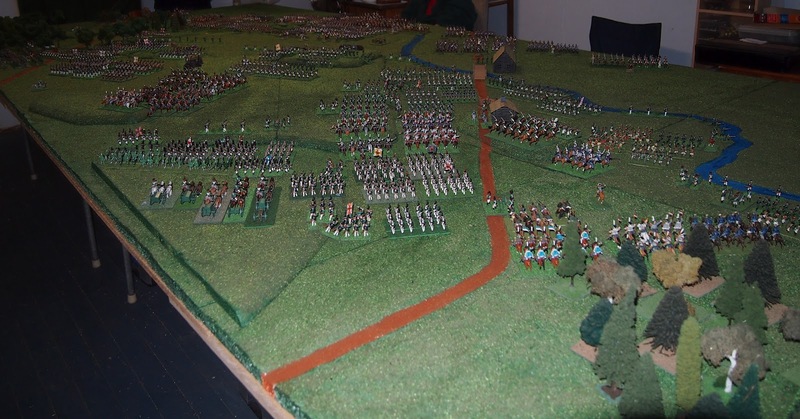 Over on the French side, a jägers-eye view of Delzons' division of Eugène's corps. Napoleon on Shevardino hill with Ney's troops in front and to the right of the photo (left of the great man). 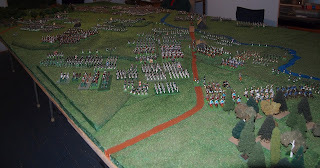 Davout's corps (Dessaix's division) is to the left of the hill (on N's right). The Imperial Guard can just be seen behind the hill. As expected and true to the 'real thing', it is a packed battlefield at the start. We are pleased with our 'oblique' transect across the battlefield (rather than the usual wargamer's approach of one army on one long table edge and the other on the opposite side) because it has allowed us to get most of the Russian on-board at the beginning while still giving the French-Allied army room to deploy and manoeuvre to the attack. 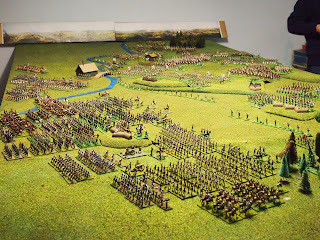 The armies are very close and densely packed, as they were, but it is possible to easily make out the corps and divisions and to move the figures. It is great when a plan comes together. This one has been months in the making and has only been possible with some contributions from our 'benefactors' and, chiefly, due to years of sustained effort on the part of Mark who has contributed the vast majority of the figures for this game. Only 19 days to 'B' day. Better get those last figures finished! 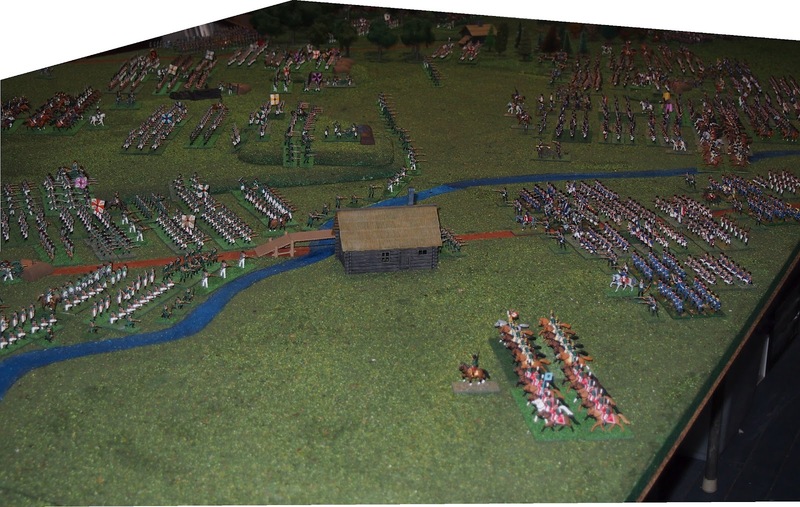 *Quarrie, B (1974) Napoleonic Wargaming. Airfix magazine guide 4. Patrick Stephens Ltd, Cambridge, UK. p. 6. Now that's impressive! Excellent looking set up. Really impressive! Waiting for the further posts! Looks great, James; not much time left to paint, though! Thanks for the supportive comments Steve, Phil and Peter. We are pleased with the way it is coming together. It is gonna be a slog (for our little plastic friends), but we'll have fun with it. This is the culmination of a 34-year plan/dream for Mark; ever since he read about Terry Wise's version in that 1978 issue of Battle Magazine! You know what it's like Peter, we'll use those cramming skills that many of us honed at Uni (College)! Actually, I do think we'll get there. Mark has a few to do and he is a painting machine (and the best painter amongst us to boot). I have the most units to do, but the vast majority of these are already 1/2 to 3/4 done. I'd like to get them to 3/4 to 7/8 done. The remainder will be 1/2 to 3/4 done. The fall back position is to improvise with other units! Excellent work James! That's going to be a corker of a game. I love the figures' eye view photos too! What scale are you doing it in, ie. how many actual men does one figure represent? Thanks for your kind comments Ben. We are using a figure scale of roughly 1:50. 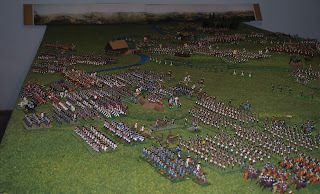 Infantry 'units' represent approximately 900 men (roughly a couple of battalions), cavalry about 600 troopers (roughly a regiment) and batteries about 20 guns (slightly more for the Russians to equalise the capacity). 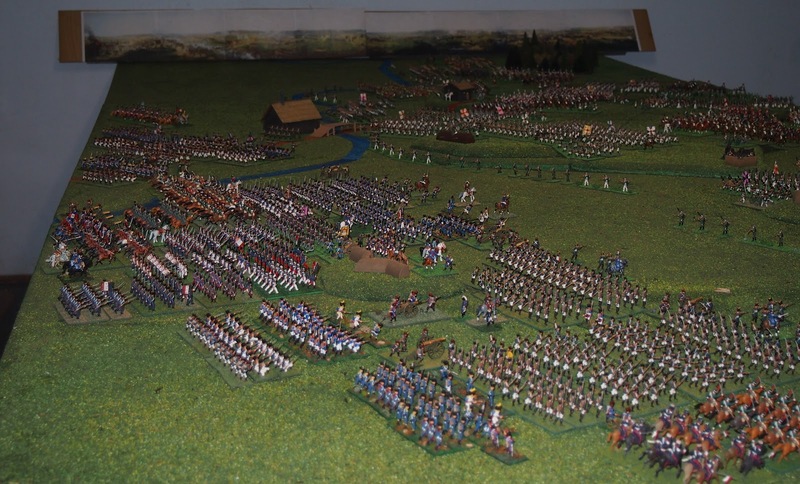 The actual units at Borodino were under strength, so, for example, a French line infantry regiment of five battalions in Davout's corps is represented by one or two of our 'units'. We constructed the terrain using a nominal ground scale of 1 mm on the table representing 2 m in reality. We are doing this as an historically-based game. The OBs are as accurate as they can be, given the above. The starting positions are as indicated by most sources. Initial orders are given at the level of which French-allied divisions must have attack (direction at discretion of the players). All Russian divisions begin the game with defend or reserve orders. 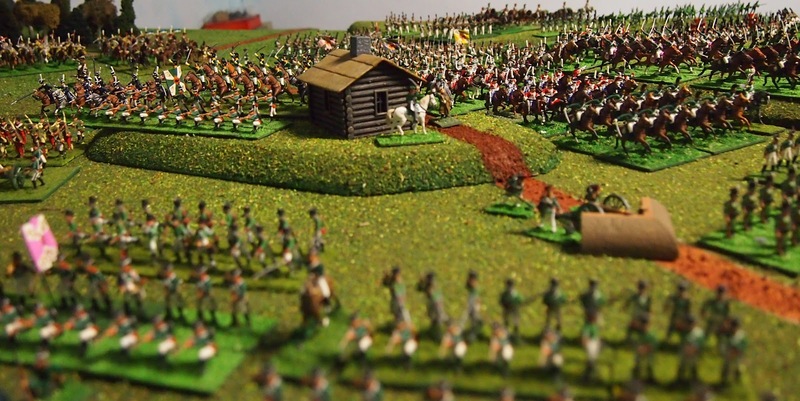 We have special rules that will restrict, almost to the point of prohibit, involvement of the Russian reserve artillery and the French Imperial Guard. There will be 12 turns representing approximately one hour each. We are going to play the game 'steadily' from Friday night to Sunday arvo', so expect to complete it fairly easily—depending on how much we banter, take photograph and 'sustenance'! great war.... heehheeh, very nice work. This is just superb James! Very impressive...love it! Incredible! Those look like 1/72 figures to me since it's the scale I'm starting to collect. Painting these men was my hobby 40 years ago and since retiring it looks like a fun thing to get back in to. So who "won" the battle and what were the conditions for victory? Cheers from the US. Thank you for looking back at this old post and for you kind comment. You'll see in that post that the game was awarded as a Russian tactical victory (and their is a link to the scenario rules). Thanks again for bringing back to mind this super game!